It's time for another episode of 205 Live on the WWE Network! Tonight, after what happened between the two Japanese men a couple of weeks ago, Akira Tozawa will take on Hideo Itami. After suffering a loss in a tag team match, Itami shoved Tozawa down and walked away. Will they settle this dispute tonight? Tune in for all the details. Hit F5 to refresh the live recap! We start out the show with a video package for the aforementioned "disagreement" between Itami and Tozawa. Tonight they will go one-on-one. Cue the opening, and the welcoming committee of Vic Joseph, Percy Waton and Nigel McGuinness. They announce that next week Cedric Alexander will defend his Cruiserweight Championship against Buddy Murphy in his home state of North Carolina. We get pre-match comments from Gulak where he claimed he will put a stop to the Lucha House Party. "You can flip and you can dive, but if you step to me, you will tap out!" Tonight, Gran Metalik will try to keep the party going for his Lucha amigos, Kalisto and Lince Dorado, who are at ringside. Before the bell dings, The Brian Kendrick and Gentlemen Jack Gallagher head out to... be ringside for this match and join commentary. Now the bell dings, Gulak with a waistlock, headlock takedown, quick cover, 1-count, Metalik puts him in a headlock, hits a shoulder block, Gulak leapfrogs over him, Metalik slaps him on the chest, springboard armdrag, Gulak rolls out the ring, and Metalik slides out the ring as Gulak slides back in. Metalik gets on the apron, blocks a punch, kicks him in the head, connects with a springboard dropkick, gets a 2-count, slaps him on the chest, Irish whip reversed, hits a back elbow, gets on the ropes but Gulak shoves him which crotches him on the top rope. Gulak hangs him upside-down in the tree of woe, stomps a mudhole iin him, throws him out the ring in front of the announce table, Kalisto and Dorado cheer Metalik on as he gets back in the ring, Gulak immediately puts him in a submission hold, Metalik tries to fight out of it, but Gulak wrestles him back down. Metalik makes a comeback with a headscissors takedown, Irish whip reversed, handspring backflip doesn't connect, Gulak kicks him, Metalik responds with a reverse sling blade, walks the ropes for a missile dropkick, and covers for 2. Gulak tosses him onto the apron, Metalik slaps him, Gulak charges after him, Metalik jumps, Gulak falls to the floor and Metalik hits an Asai moonsault in one swift motion! Back in the ring, Metalik connects with a springboard splash for 2, slaps him on he chest again, Gulak comes back with a discus clothesline and covers for a near-fall. Both men are down, Metalik picks himself up in a corner, side-steps him, hits a superkick, goes across the ring, gets on the top turnbuckle, walks the top rope and lands a missile dropkick to a slumped Gulak in a corner! Metalik makes the cover, covers, 1-2-KICKOUT, picks him up for the Metalik Driver, Gulak slips off, sets up a suplex, Metalik lands on his feet, hops onto Gulak's shoulders, victory roll for 2, Gulak counters for 2, ducks a swing, Metalik blocks a rollup, hits a back elbow, goes for a springboard moonsault, but Gulak got his knees up, then locks in the Gulock and Metalik taps out. WINNER: DREW GULAK. Kendrick and Gallagher are applauding Gulak after the match, and Gulak responds in kind. The commentators talk about Buddy Murphy and we get a video package for him getting ready to challenge for the title. TJP comes out next, and we see a tweet he posted: "Since I usually have Tuesday nights free I might as well make the most of it... @realpaigewwe you got room for one more on the blue team? #CruiserGreatAnywhere #206TJP" Basically, he's complaining that he isn't used on 205 Live and wants to be on SmackDown Live. TJP wrestles this Guy, headlock takedown into a hammerlock, flips over him, daps and takes a bow. He does an arm wrench, headstand headscissors, goes into a hammerlock, yanks the other arm back with extra force, throws him shoulder-first into the turnbuckle, hits a European uppercut, chokes him with his boot, Irish whip, kick to the gut, standing suplex, floats over, back suplex, does a tope atomico from the apron and gloats. 205 Live GM Drake Maverick is looking on backstage and just shakes his head at TJP's behavior. Guy blocks the Detonation Kick, dropkicks him, floats over him out a corner, goes for a springboard sunset flip, but TJP rolls through and dropkicks him in the face. TJP locks in a deathlock, curb stomp, hits the Detonation Kick and gets the 1-2-3. WINNER: TJP. Dasha is in the ring to interview TJP asking him about his comments on social media. TJP says he thinks was the best Cruiserweight Champion, calls himself the greatest technical wrestler in the world, then claims he revived cruiserweight wrestling and carried the division on his back. "If THAT is the best competition that I deserve, well then you know what? It's crystal clear what 205 Live management thinks of me." We see numerous tweets from many people praisiing Cedric Alexander and Mustafa Ali having great matches on the European tour. 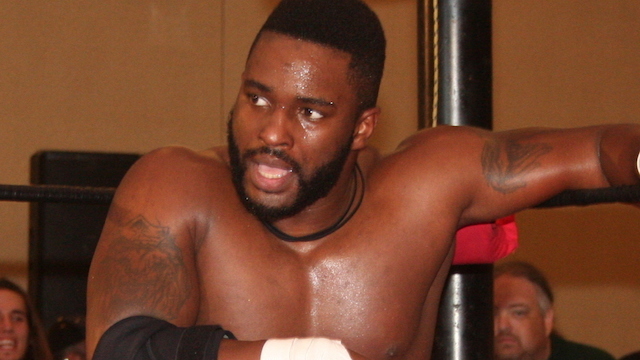 We get a one-on-one sit-down interview from Vic Joseph with Cedric Alexander asking him how he feels about the roll that he's on since becoming champion. Cedric says it's "another day at the office" then talks about defending his championship in his hometown in front of his friends and family. Cedric reminds us that he himself had to cut weight just to be involved in the Cruiserweight Classic, so he knows what Buddy Murphy went through. He says he is well-rounded as a wrestler and will prove it against Buddy Murphy next week. A while ago we saw Tozawa getting mentally prepared, now we see Itami getting ready, and their match is next. After a quick commercial break, Hideo Itami heads to the ring shouting "Respect me" to anyone who will listen. Dasha interviews Tozawa backstage asking him about his mindset. Tozawa calls Hideo a legend, but says he didn't respect him. "If Hideo didn't like me as his partner, he really won't like me as an opponent!" The bell dings and both men immediately start kicking each other at the same time. They start slugging at each other, Itami with a sunset flip, Tozawa rolls through, Itami ducks a kick and rolls him up, Tozawa rolls through again, ducks a roundhouse kick and they have a stalemate. They circle around the ring, the crowd does Tozawa's chant, Itami doesn't like it, Tozawa blocks a kick and chops him, Itami chops him back, Tozawa chops him back again, Itami chops, Tozawa chops, Itami chops him harder, Tozawa chops back just as hard, Itami chops with more force, Tozawa fakes a chop as Itami covers up, so he jabs him instead. Tozawa stomps a mudhole in Itami in a corner, picks him up, snapmare, running kick to the chest, jumping back senton, gets the crowd to chant, stomps on him, picks him back up, body slam, covers for 2 then puts him in a rear chinlock. Itami counters with a jawbreaker, Tozawa clubs him on the back, chops him in a corner, then another, then another chop. Itami gets whipped into a corner, tosses him up and over, Tozawa hits a forearm from the apron, Itami side-steps an incoming Tozawa through the ropes and kicks him in the chest, then hits a jumping flying knee to the back of the head. Itami shouts "Show me respect!" followed by hitting a neckbreaker and covers for 2. Itami hits a baseball slide kicking him out the ring, goes after him, throws him into the barricade, kicks him in the chest, throws him back into the ring, covers for 2, then puts him in a chinlock. Tozawa gets to his feet, Itami goes on the attack, Tozawa gets his boots up in a corner, dives off the middle ropes, Itami kicks him in the gut in mid-air, shouts for respect again, picks him up, hits a running knee to the midsection, blatantly disrestpects him and mocks his taunt. He kicks Tozawa while he's down, Irish whip, another running knee to the midsection, kneedrops, fakes a jumping kneedrop, kicks him in the head, hits a spinning DDT and gets a near-fall, then puts him in a rear chinlock. Tozawa counters another running knee for a schoolboy rollup, gets a 2-count, Itami kicks him in the face, Tozawa does a jumping hurricanrana, hits a shining wizard, struggles to climb to the top rope, Itami rolls out he ring, so Tozawa hits a running cannonball from the apron. Tozawa throws him back into the ring, gets on the top, connects with a missile dropkick, and covers for a 2-count. Itami slowly gets up, blocks a back suplex, hits elbows to the back of the next, Tozawa chops him on the chest, Itami puts the boots up in a corner, does a tornado hotshot, gets on the top, connects with the flying clothesline and gets 2.9! Itami picks him up, palm strikes, misses the backfist, takes him down in the Fujiwara armbar, switches for the Rings of Saturn, but Tozawa blocks it, rolls him up in an inside cradle for 2, hits the roundhouse kick, looks to go back up top, Itami cuts him off tripping him up, hits another palm strike, climbs up to him, sets up for a superplex, Tozawa fights him off, sets up for a fisherman's suplex, but Itami blocks it, headbutt, and hits a TOP ROPE FALCON ARROW!! Itami crawls over, makes the cover, 1-2-KICKOUT! After a couple of replays, Itami finds new life by running the ropes and hitting a flying knee, covers and gets a near-fall. Tozawa goes for a tilt-a-whirl headscissors and locks in the octopus stretch! Itami reaches the ropes and falls out the ring, Tozawa hits a suicide dive/tope suicida, throws him back into the ring, gets on the top rope quickly, goes for the diving back senton but CRASHES HARD when Itami rolls out of the way! Itami hits the hesitation dropkick in the corner, hits another hesitation dropkick, picks him up, spins him around, knee strike to the head, covers and gets the 3-count! WINNER: HIDEO ITAMI. We get replays of the top rope falcon arrow, suicide dive, missed diving back senton, hesitation dropkick, and the knee strike. Next week, Cedric Alexander puts his Cruiserweight Championship on the line against Buddy Murphy. That's all for 205 Live!